Huawei is transitioning to a big player with premium options and already has concrete results to show. The company has shipped 16.8 million smartphones in Q3 this year and 26% of them were mid to high-end devices. It grew 23% overall compared to last year and 18% in its home country of China. The company also showed impressive growths in developing markets (the Middle East and Africa especially, where shipments are up 322% compared to last year. The CEO is confident and makes comparisons with market-leader Samsung, which is having difficulty penetrating some developing markets where Huawei is ahead of the Koreans. 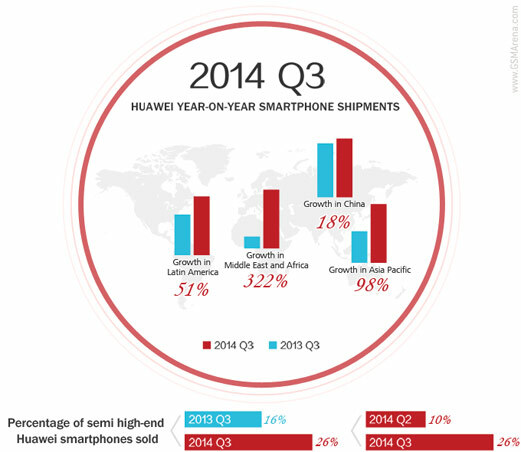 The new Huawei Ascend Mate7 alone has sold one million units since its recent introduction. Its price starts at CNY 3,000 ($490) but there's a pricier version at CNY 3,700. Huawei's CEO says that until recently there was a distinct lack of domestic premium devices and CNY 3,000 was considered the upper limit of what users will buy. In response most Chinese manufacturers focused on ultra low-cost devices, which puts Huawei's 26% mid-range to high-end statistic in better perspective. Huawei will face further issues though, Chinese carriers have ended subsidies and have been lowering marketing budgets for three years running. Apple is better than samsung sir, your phone is a trash.